West Virginia acknowledges and rewards the craftsmanship work of artisans to an equal standard of fine artists. The McDonald sisters are examples of this promotion. 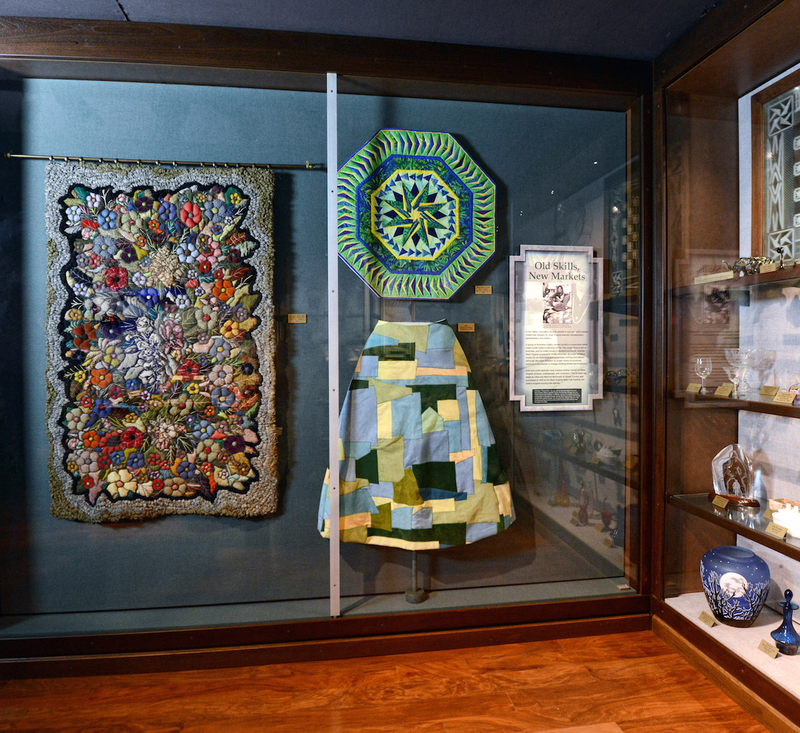 Their tapestry (rug) hangs prominently in the Legacy of Craftsmanship room, State Museum, Charleston, WV alongside of a quilt and patchwork skirt by the Mountain Artisans. “The Appalachian region has a long tradition of activity in the crafts, and it is one of the first geographic areas in the United States to emphasize the redevelopment of the crafts movement within the 20th Century industrial society. It is an area containing a great diversity of crafts, from indigenous folk techniques handed down through the generations to more contemporary methods of handling materials and objects learned in the academic environment. Blanche McDonald’s rug was accepted as Traditional Folk Craft and received a $100 purchase award from the West Virginia Arts and Humanities Council. This piece is now in the archives at the State Museum. I have been able to examine the materials and process. The label on the exhibited piece which was purchased in 1970 describes the piece as appliqué’ and hooked. 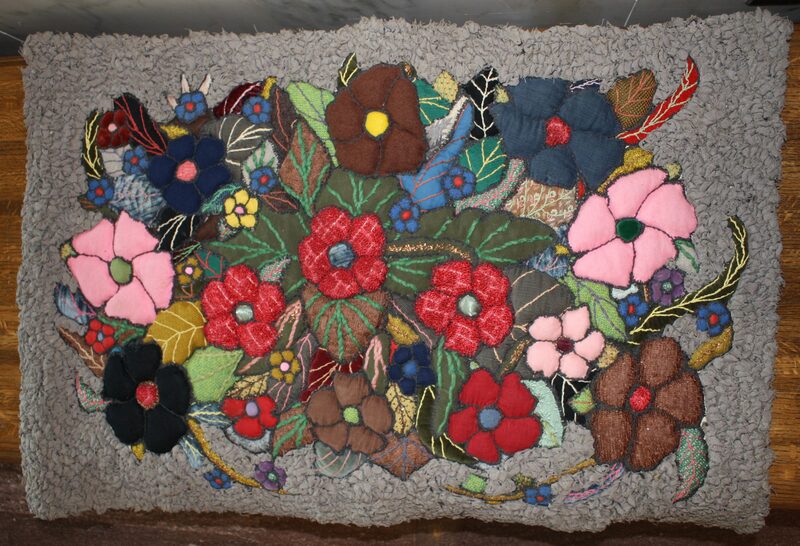 Visually the loops of fabric filling in around the appliqué’ and stuffed abundant flower collection resemble rughooking. I felt excited to see an example of the traditional loop pulling technique in my artwork and wanted to learn more about the people who made the piece. With blindfolds on my research began. Until a newspaper article described their process as ‘faux’ hooking. Hmmmm. I had to actually see one of these and look at the back to understand process. The purchase rug was brought out of archives for this examination. By turning it over I realized the backing (foundation fabric) used was too tight a weave to hook wide strips of fabric through. It was a muslin or cotton sheeting. And there were many haphazard stitches showing underneath the very loops I saw on the front. The sisters gathered several loops at their base, ran a thread through this and went back down through the backing to anchor the grouping. Over and over to cover the space with loops of hand cut uniforms or mens clothing! What a tedious process compared to pulling loops up through a looser weave and going back down with the bent hook to pull another working from the front to see the position of each loop. Why did they perfect this time consuming effect? Research has lead me to presume availability of materials, skills and no other person near them who hooked to advise tools or methods. They probably saw hooked rugs in the monthly magazines which ran articles featuring the colonial crafts and liked the look. They were using threads, yarns, clothing, upholstery and drapery fabric in the compositions. Make-do people, there are even unraveled Brillo pads … coppery threads in several examples I have documented. (See example above). Refer to the gallery of work I have tracked down to date on the McDonald’s page. I am still searching and would also be interested in appraised value on their work. Anyone who knows of other examples please contact me.